The Candy Crusher Trap is a Shadow type weapon. A sweet treat looking for something to eat! This candy glob, once infused with evil, has been re-shaped, re-forged and re-purposed into a mouse-crushing candy mandible of hardened sugar nightmares! The trap lies perfectly flat, and once a mouse approaches, the mouth-watering kaleidoscope of candy and colours springs upright and chomps down with its SPEAR-mint fangs! Soft, gummy teeth may be used as a non-lethal alternative to contain the mouse. "NEW! The Candy Crusher Trap! The sweet, candy snack that really bites back!" The Candy Crusher Trap is a Limited Edition weapon. It was not sold by any Trapsmith. It was only obtainable as loot by catching a Bonbon Gummy Globlin Mouse mouse during the Halloween 2015 event. 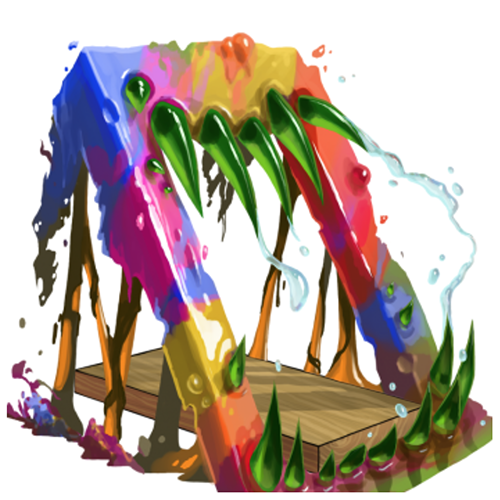 21 October 2015: The Candy Crusher Trap was introduced at the start of the Halloween 2015 event. This page was last edited on 13 January 2019, at 14:42.